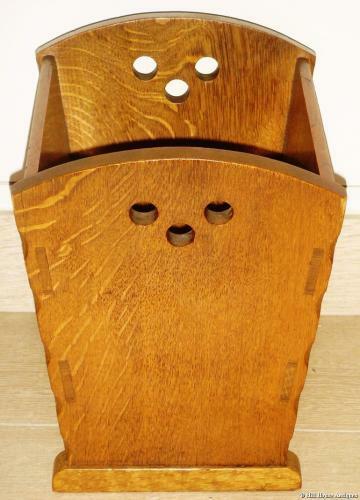 Lovely little golden oak Cotswold School waste paper basket (or can be used as a planter) in pristine condition; by the superb Arts & Crafts furniture maker & designer, Stanley Webb Davies c1953; signed and dated with further incised monogramme of Fred Ellison, one of his craftsmen. Typical "gouging" and chamfering detail and three circular piercings to tow opposing sides. A real beauty!